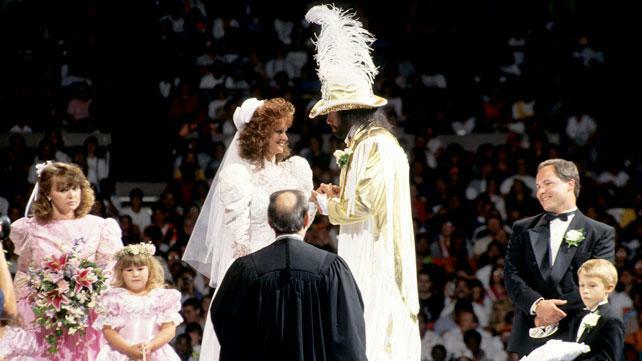 SummerSlam 91 had a tagline of "A Match Made in Heaven, A Match Made in Hell." The Hell part I've discussed in previous posts, as Hulk Hogan and the Ultimate Warrior battled Sgt. Slaughter, Col. Mustafa and Gen. Adnan. 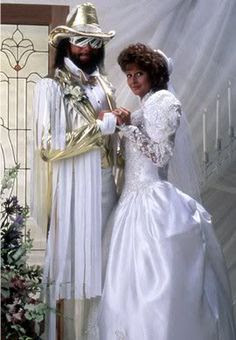 The heavenly part of the night was the marriage of "Macho Man" Randy Savage and Elizabeth. in real life for nearly a decade at that point). So SummerSlam was spot for the nuptials. The wedding went off without a hitch, unlike most weddings in the wrestling business. 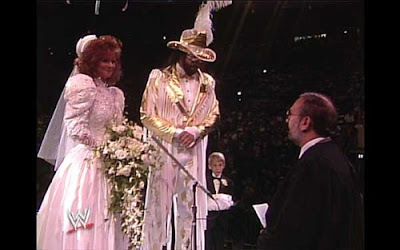 Savage was dressed in a tuxedo version of his in-ring garb complete with a cowboy hat. Liz looked lovely as always and when asked if he takes Elizabeth, Macho Man responded with his classic "Oooohhhh yeahhhhh!!!" The two kissed and promptly headed to the reception. That's where uninvited guests The Undertaker and a newly turned heel Jake "The Snake" Roberts ruined the fun. 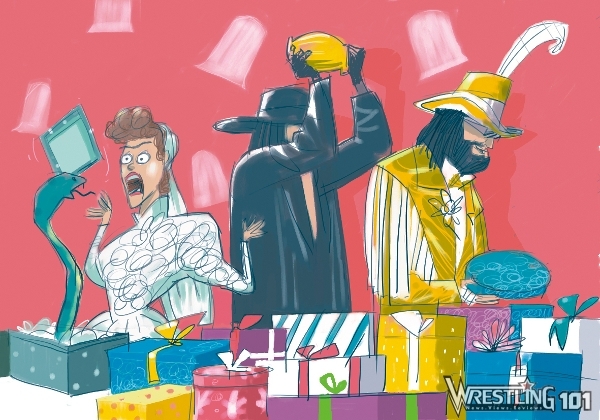 A snake popped out of a gift box and the Undertaker hit Savage in the head with his urn. Sid Justice sprang into action to help fend off the bad guys. The actions lead to the feud between Savage and Roberts, which included the cobra sinking his teeth into Savage's arm and President Jack Tunney finally reinstating Savage to wrestle Jake in a great series of matches before Roberts finally left the company. For years I had worked at a grocery store in the video department. I had just left for college when SummerSlam '91 happened. When the VHS copy arrived at the store for rental it included a picture of Savage and Liz with a suction cup. Someone sent it to me and I promptly hung it from the window in my dorm to further geekify the room and let everyone know I'm an uber wrestling nerd.